The Gazette is the official magazine of The Boys’ Brigade in the United Kingdom & Republic of Ireland. The quarterly magazine for leaders is sent out to around 9,500 of our registered leaders and is also available online – read the Gazette now. Issues are Winter (January), Spring (April), Summer (July) and Autumn (October). The Gazette contains information, news, resources, discussion and topical features focussed on supporting our volunteer leaders. If you are registered as a leader in The Boys’ Brigade (in the following categories of leadership: Captains, Lieutenants, Amicus Leaders, Warrant Officers, Battalion/District Office Bearers and Reserve Officers) you will receive a copy of the magazine as part of your membership. If your category of membership does not receive a Gazette or you are not a leader and would like to receive the Gazette, then you can become a subscriber by completing the form and sending in your annual payment. Want to contribute to the next Gazette? Please send all contributions to the Editorial Team to gazette@boys-brigade.org.uk. We accept small advertisements within the ‘Directory’ section of the magazine as well as quarter/half/full page adverts throughout. 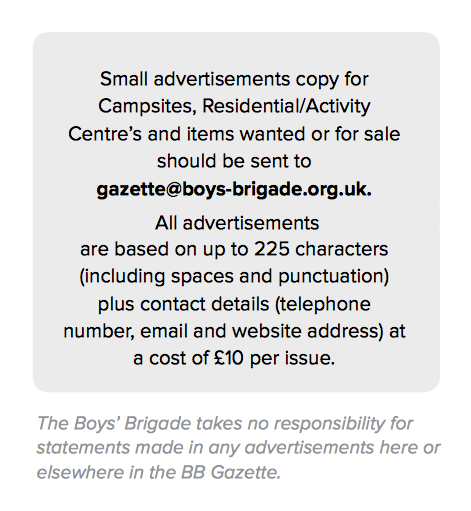 For more details on advertising within the magazine see our advertising information and rate card or contact Chris Norman (chris.norman@boys-brigade.org.uk or 01442 231 681).